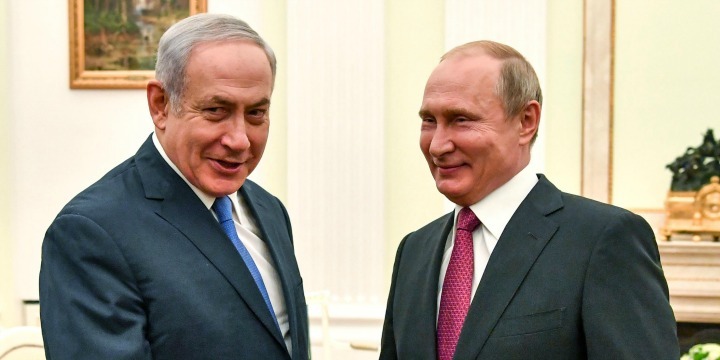 JERUSALEM (JTA) — Israeli Prime Minister Benjamin Netanyahu will meet with Russian President Vladimir Putin in Moscow, five days before Israel’s national elections. The Prime Minister’s Office announced on Tuesday that a meeting between the two leaders will take place on Thursday. The announcement comes a day after an announcement that Netanyahu and Putin spoke by phone and discussed “regional issues.” The prime minister later told reporters that the talks were about Syria, whose president, Bashar Assad has been backed by Russia in the country’s ongoing civil war, and who has allowed Hezbollah and Iran to gain a foothold in the country from which it could attack Israel. The two leaders last met in Moscow in February. They have met 12 times since September 2015, Haaretz reported. Netanyahu has promoted his diplomatic success and personal ties with world leaders during the current election campaign.